An ingrown hair is a hair that has grown into the skin rather than out as it would naturally. This occurs after shaving or waxing. The hair curls during regrowth and grows back into the skin. Ingrown hairs are more common in curly-haired people, and guys who have beards. Ingrown hairs surface within days after a close shave or other type of hair removal. 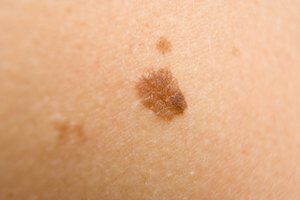 They start as small bumps on the skin resembling pimples and may have a red or white head. The hair trapped within the bump is usually visible up close, so if you look carefully you can see it. There may be one bump or several and the skin around them may be red and irritated. Ingrown hairs will go away, but only after the hair grows out naturally. This process can unfortunately last anywhere from a few days to several weeks depending upon the severity of the ingrown hair. Warm compresses applied to the skin can help ease discomfort as the hair is growing out. Loosening the hair follicle from the bump with a sterile needle will help to speed up the healing process, too. Plucking the hair or continued hair removal may cause hair to become ingrown again and extend the recovery time, so avoid that. When suffering from an ingrown, take a break from shaving. Continued hair removal can irritate the skin and cause conditions such as Barber's Itch (Tinea barbae). This happens when the ingrown hairs are infected by the bacteria Staphylococcus or a fungus. Infection will slow down recovery times and may require medical treatment, ouch! Consult a doctor in cases where ingrown hairs appear to be spreading or when the bumps have not healed after several weeks. You should also seek medical treatment if the irritation and pain of ingrown hairs is super bad. This may be due to an infection, and you'll need lab tests to determine the cause and proper treatment.